Tonight the Los Angeles Dodgers (84-78) and the Philadelphia Phillies (92-70) will face off in their best of seven series to decide the National league's representative in the World Series. By rights, the Dodgers should not even be in this series. Throughout the Chicago Cubs schedule in the regular season, they were a vastly better team, with the best run differential in MLB, the best offense and the best record in the National League. Whether it was their lack of playoff experience, poor managing, overconfidence, or a livestock curse, the Cubs fell apart in almost every conceivable manner. They made four errors in one game, and six in the three-game series, despite having had the second best defense in MLB, as measured by FRAA, a Baseball Prospectus stat. Their league-leading offense hit .240 with one home run. The pitching staff, which had the second best adjusted ERA in baseball, posted a 5.19 ERA in the three games, and only one of their three starters escaped the 5th inning. "Anything can happen in a short series." And it sure as hell did to the Cubs. I give credit to the Dodgers, to a degree. They won their games. They capitalized on the mistakes the Cubs made. Of course, if they hadn't, the Cubs were going to make another one the next inning, anyway, but they didn't know that, even if the Cubs' fans did. I mentioned in my column previewing the 2008 ALCS that Baseball Prospectus' Secret Sauce calculation can be a useful tool, but of course one-third of that is the closer's performance. In the case of the Rays, though they did not use Troy Percival in the ALDS, they could still use him in the ALCS, while Los Angeles almost definitely will not include Takashi Saito. Even if they do, it's unlikely, given how well Jonathan Broxton has thrown, to expect that Saito would again be made closer after not pitching for two months. Using Broxton's number improves the Dodgers' Secret Sauce rank by three, bringing them into a virtual tie with the Phillies anyway, 41-40, with the Dodgers being fairly evenly ranked in the three components (14th in defense, 12th in K-rate, 15th in closer strength). The Phils, by contrast, are 22nd in K-rate, 17th in fielding, but make up for those by having the best closer in baseball, Brad Lidge. That 5-place gap in fielding should be taken with a grain of salt, though, as it represents a difference of only 5 runs over the course of the season, which works out to about 1/5th of one run over the course of a seven game series. Basically negligible. So Secret Sauce is out for this one. What else can we use? The Bill James playoff prediction system, which is a calculation based solely on the two teams' winning percentages in the regular season, gives the Phillies a 55% chance of winning this series, slightly better than tossing a coin. Coolstandings.com has that number as well, presumably because they used the same calculation I did. That's not much help either. Over the regular season, the Phillies were second in the NL in runs scored (tied with the Mets, with 799, WAY less than the 1000 runs some were predicting before the season started). They were third in OPS, and second in slugging percentage to the Cubbies, who had a slightly larger park effect for offense. The Phillies walked fairly often, 5th in the NL, and led the NL (second in the majors) with 214 home runs. They also stole 136 bases, 4th in MLB, and had the best stealing success rate (84%) in baseball. The bad news for Philly is that the Dodgers do not walk batters and do not allow home runs or steals. They were 2nd in the NL in fewest walks allowed (7th in MLB) trailing only Arizona in that respect. More important, they allowed the fewest homers in MLB, by far, only 123 in 162 games, and as I mentioned, only one to the Cubs' vaunted offense in the NLDS. And lest you think that this was just an effect of playing in Chavez Ravine, the Dodgers allowed the 6th fewest homers in road games in MLB as well. Los Angeles also kept baserunners in check pretty well, allowing only 82 successful steals all season, 5th best among the 16 National League teams. The Phillies, my Phriends, are out of tools. Now we're going to have to start looking at actual players. Sheesh. The Dodgers are going to have to score runs themselves, not just prevent them, if they want to win this thing. Though they scored just 700 runs this season, 7th worst in MLB, this is partially due to their home park favoring pitchers, suppressing run scoring by almost 16%, according to ESPN.com. Additionally, it's worth noting that the advent of MannyB in Dodger Blue has increased the team's runs scored by almost half a run per game. They averaged 4.63 R/G in the 54 games with MannyB, compared to just 4.17 without him. In August the Phillies and Dodgers met eight times, and split the games evenly, each sweeping the other at home. The Dodgers won their four games by one or two runs each, outscoring the Phillies 22-16. But then, Philadelphia demolished the Dodgers, scoring 27 runs and allowing only five in the 4-game set. The clobbered both wily old veteran Greg Maddux and studly youngster Clayton Kershaw in the first two games, then chipped away at the bullpen in the other two games. Again, there's a problem here for the Phillies: Greg Maddux won't be starting against them in the NLCS. Kershaw may, but not until Game 4. They'll have to face Derek Lowe, who's 4-1 with a 3.02 ERA in his career against Philadelphia, and who has held current Phillies to a .220 batting average. In Game one, Lowe opposes Cole Hamels, no slouch himself with a 2.57 ERA in 14 career innings against Philadelphia. Friday's match up pits Chad Billingsley against Brett Myers. Both pitched well their last time out, but Brett Myers has been so flaky as a starter this year, I wouldn't be surprised if he just imploded. In fact, I fully expect he will. Billingsley has been much more consistent, and his ability to strike out a batter an inning should play well against the Phightin' Phils, who phought their way to 1117 whiffs this season 12th most in the majors. Sunday's game matches Hiroki Kuroda, one of the unluckiest pitchers in the majors this year, against 57-year old Jamie Moyer, who was one of the luckiest. The 93-year old Moyer lasted just four innings against Milwaukee in the NLDS, and while he's seemed ageless at times this year, he's really 235, and the reality is that he's got to be reaching the end. Which makes sense, given that he's almost a thousand years old. The Dodgers should be able to get to Moy-thuselah without much trouble. After that, it's uncertain who will start for the Dodgers, though the Phillies seem set. 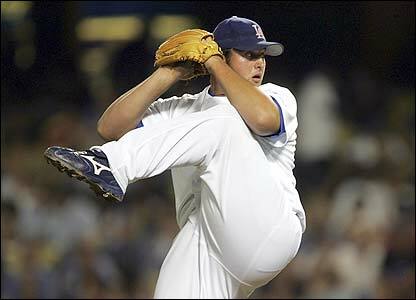 They should go with Joe BlandOne Blanton, who went 9-12 with a 4.69 ERA, the very definition and epitome of LAIM. Fifth starter Kyle Kendrick, who, on a scale of one to ten, was lousy this year, was left off the NLCS roster, so he's not an option, and you wouldn't want him anyway. Cole Hamels has never started on 3-days rest in his major league career, so I doubt they'd go that route. The Dodgers could start Derek Lowe on three-days rest, or they could go with Kershaw. this may depend on how many pitches Lowe has to throw in Game One, on how well Kershaw looks throwing on the side, how desperate the Dodgers are if they're down 3-0 or 2-1, or perhaps something else to which we won't be privy. As a Yankee fan, I remember Lowe starting against us on 3-days' rest in the 2004 ALCS all too well, and if I'm a Philly Phan, it scares the crap out of me. There are a couple of X-factors here. One of them is that Joe Torre's got a lot more playoff experience than Charlie Manuel, who was just 2-6 in eight playoff games before 2008. Torre's probably got the stinging defeat of the 2004 ALCS in his mind, not to mention three first-round exits from the playoffs before this year. Psychologically, he'd probably like nothing better than to get another shot at Terry Francona and the Red Sox, this time in the World Series. 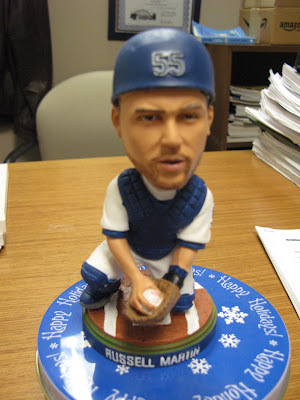 And speaking of psychology, it's worth noting that Brad Lidge has not blown a Save all season. A friend of mine who's an avid Phillies Phan told me in September that he was actually hoping that Lidge would have a bad outing or two in September, to get it out of the way and take the pressure off, but of course this never happened. Lidge went 41-for-41, and now everyone is waiting for the other shoe to drop. Lidge doesn't have the long history of Philly collapses in his blood, but he's probbaly not unaware of them either, and it seems to me he's got some history of choking on his own anyway. The Dodgers are not a good enough team offensively to just blow the Phillies out and keep Lidge in the bullpen, so his ability to keep from imploding could prove crucial. My best guess is that the Dodgers pull it out, 4 to 3.